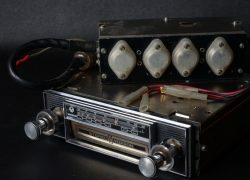 Item description: Voxson model 104 radio / 8 track player as fitted to 1960s Ferraris such as the Dino 246 GT, GT 365, GTB 4, and even the Daytona GTC / 4. 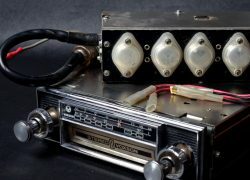 Jensen Motors were the first British car company to install the Voxson, and these were fitted to the Jensen Interceptor and FF from 1968 as an option. 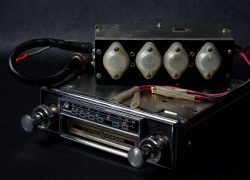 The unit complete with its chrome and black finished facia, and the stainless steel, Voxson branded, 8 track cartridge flap. The casing in metal. 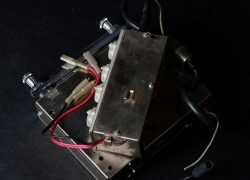 Complete with its seperate amp unit and all related wiring. Condition report: This unit has a very clean casing, and clean front, with light age showing to the Voxson flap. The unit has been tested and is currently not working, Sold for overhauling, or rebuilding with modern workings. 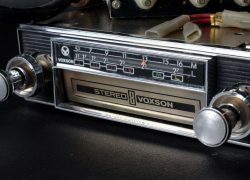 Special notes: The Voxson 104 model radio / 8 track player was brought out in 1968. Jensen Motors brokered an agreement with Voxson for them to supply units to Jensen Motors. 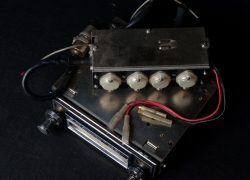 Initially, the standard Voxson unit with Voxson-branded flap was fitted to Jensen cars, but Jensen Motors had their own Jensen-branded flap fitted to the majority of units. That said, even some Mk.II Interceptors and FFs ended up with Voxson flaps, so there was probably a mix of units as they were fitted to cars.